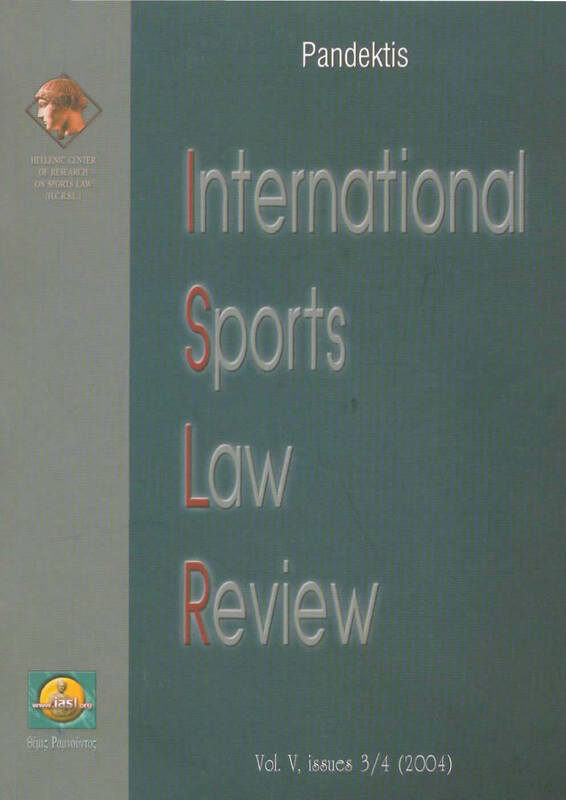 James A. R. Nafziger: "Comments on applying International Sports Law in the United States"
Ayodeji Peter Abbonjinmi: "Legal basis for coaches liability in sport and recreation"
Dimitrios Panagiotopoulos: "The institutional autonomy of sport and the limits of the economic freedom"
Roberto Branco Martins: "The Kolpak Case: Bosman times 10- Football fears the arrival of Bosman, Bosmanovic and Osman"
Dele Akpata, Eliwaja Wilson: "Risk management practices of sports organisations in Tanzania. An analysis"
Maria Jose Carvalho: "The legal framework of high-perdormance sport in Portugal"
Dimitrios P. Panagiotopoulos: "Lex Sportiva: Sport institutions and rules of law"
Ayodeji Peter Abbonjinmi: "Tortious/delictual liability in sportand recreation"
Andras Nemes: "Sports policy in Hungary in particular with regard to youth sport"
Lingling Wei, Martin Kretschmer: "Ambush marketing: a study of strategies and legal responses"
Joaquin Sotelo Gonzalez: "Sport as An element for European integration"
James A.R. Nafziger, "Circumstantial evidence of doping: Balco and beyond"
Karen Bill "The prevalence and nature of age discrimination practices in UK sport and recreation organisations"
Huang Shixi "Anti-doping in Chinese Sports"
Andras Nemes - GΑBOR CSAPΣ "Modernization of the higher education of per with special regard to trainers’ instruction in Hungary"